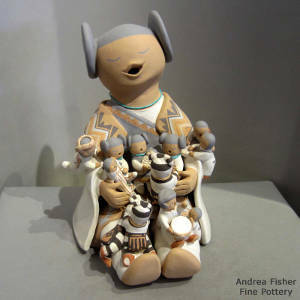 Clay figures have been present in New World pottery for thousands of years. Pottery figures of animals and humans have been found near Valdivia, Ecuador and were dated to about 3,500 years before the present. 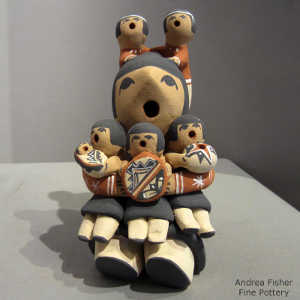 Fast forward to today and there's a whole universe of effigies and figures in the Native American pottery world. However, there was a time not long ago when the making of figures was banned and the makers were punished. That time was during the European invasion, specifically the Spanish invasion during the Spanish Inquisition. By the time the railroads arrived, pueblo potters were back in business, although on a lesser scale as the use of utilitarian pottery dropped off when traders with enamel cookware came through in the mid-1800's and pottery as art hadn't happened yet. 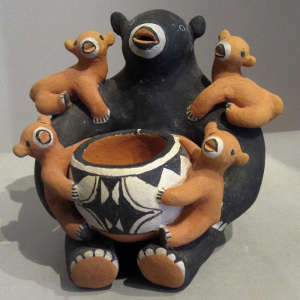 The railroads changed that as traders from the railroad companies went into some of the pueblos and "pre-ordered" specific types of pottery they could resell as tourist trinkets. That opened up a period of higher and higher production of progressively lesser and lesser quality pottery until the market died. In the pueblos most involved in that business, pottery production dropped off to only what was needed for ceremonial or utilitarian purposes. 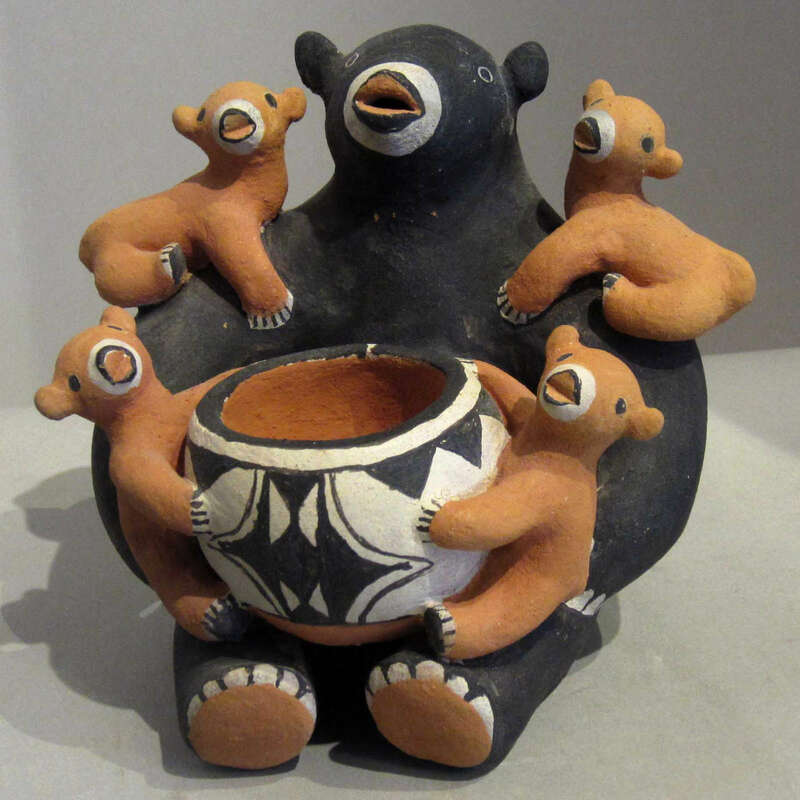 As other pottery-producing pueblos missed that trainwreck and were beginning to develop a market with pottery-as-art, those hit hardest by the railroad traders began to adapt their products and develop their own art market, too. Some potters were lucky in that they were able to attract investors, traders who saw the value in helping individual artists develop their craft. One of those investors was an art dealer from Albuquerque named Alexander Girard. And he invested in Helen Cordero of Cochiti Pueblo. In 1964 Helen produced the first storyteller figure. She'd been making pottery since the mid-1950's but hadn't been happy with the usual plates, jars and bowls she made. Then her cousin suggested she make figures instead. She said she felt like something bloomed inside her with that. Cochiti Pueblo has a long history of making figures and Helen was innovative with her creations. That's what attracted Alexander Girard to her. 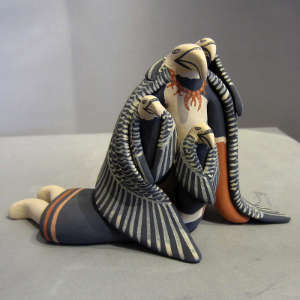 He offered to buy everything she made but he also encouraged her to branch out and experiment with building larger and more complex figures. 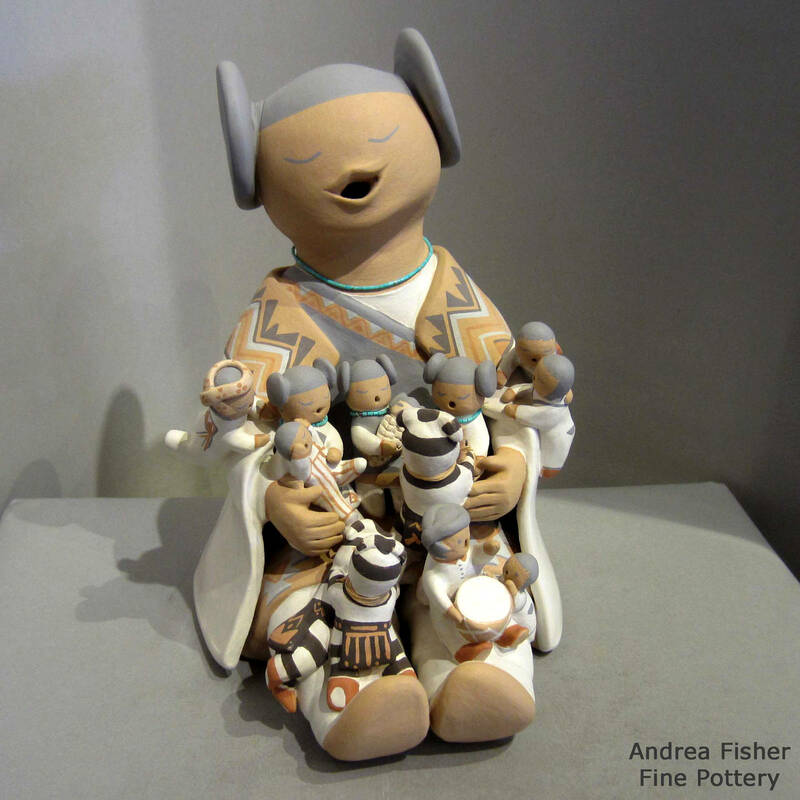 One of the traditional forms at Cochiti was the "Singing Mother," a seated figure holding a child. 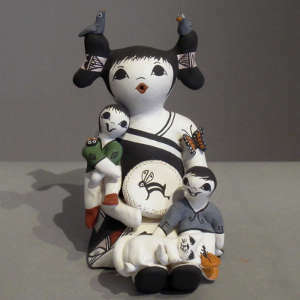 Helen was working at creating a Singing Mother that she would be happy with but she says she kept seeing her grandfather's figure in her mind as she worked. Her grandfather was a "storyteller," a member of the tribe who carried part of the tribe's oral history. 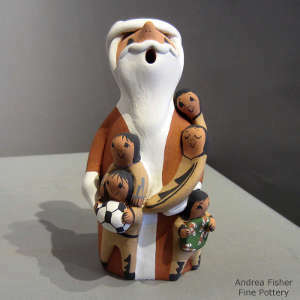 And he passed that history down to the children by singing the stories in his native tongue. And he usually had numbers of children around him when he sang. In honor of him she built the first storyteller. 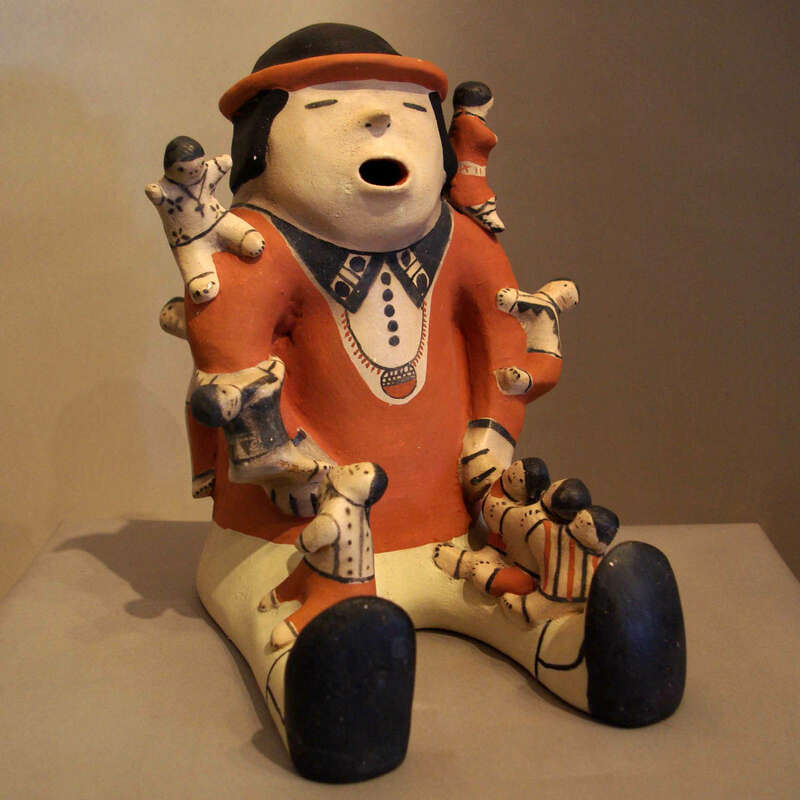 To her, the figure needed to be male as men were usually the tellers of the oral history. And the best way to show the reason for a "storyteller" was to also attach figures of children to him (or her). So she built her first one in honor of her grandfather and she perched a bunch of kids on him. She named it "Storyteller." That first storyteller made history. Today, as many as 300 potters spread across 13 pueblos have adapted that original idea to their own tribe's perspective and created storyteller figures of their own. And many of those figures are not men and women but bears, birds, Santa's, mudheads, owls, koshares... all different sizes and shapes... and some of them have more than 100 children attached to them.